Personalized room based home automation is tricky business. Not everyone wants to install RFID readers in the doorways, or carry around the cards :). Roomme takes on this problem by using a $69 smoke alarm sized BTLE sensors attached the ceiling in each room that senses when your mobile phone enters the room to trigger a scene. The approach is very clever, and since they support hierarchy within the personalization (e.g. Parent, Child, Room Master roles) one of the big hurdles has been cleared. Unfortunately however, the V1 implementation (like many V1 implementations) is a bit kludgy. With the main issue in the approach that the rule engine runs on the mobile device, where a single hub based solution would make for much more reliable orchestration and state management. Speculating, I expect that cost was the main driver here. Personally, given the expected outlay (N rooms * $69) I would happily add the volume cost of a Raspberry Pi to the BOM for reliability. The last, and most minor, is that only entry events are supported. So the full automation cycle is left incomplete. If the lights turn on, music starts playing, and my desired temperature is set when I enter the room. Everything should go back to the previous state when I leave. It isn’t very smart if I have to undo all those things manually. There aren’t real exit events, only entry events, but they do use the entry events to attempt to clean up prior state (i.e. approximate an exit event). I had documented this in my meeting notes, deciding to leave out this more detailed explanation because (frankly) I think it’s a bodge. While this can work (key word “can”), it’s incredibly fragile because it depends entirely on a usage flow that won’t play out in real installations. Some examples of this would be if a user doesn’t install the sensors in all the rooms of the house (i.e. they only put them in the bedrooms), or if they put them at entry points to the house, where exiting the home without entering another room will occur. I completely understand that exit is a hard thing to detect, and in most scenarios you probably want significant lag in the system (i.e. wait ten minutes before running the exit in case the person comes back, or the heartbeat was missed, etc), but that doesn’t change that this system as it is currently designed only really supports “entry”. To be clear, while this write up is critical, it is because the underlying idea is so neat. 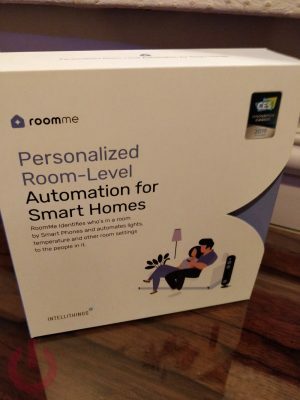 There is massive potential in personalized room based home automation, and Roomme has a solid foundation to build something powerful. If it was a bunch of rubbish, it would have been ignored along with the multitude of sloppy-tech pitches that inundate CES.